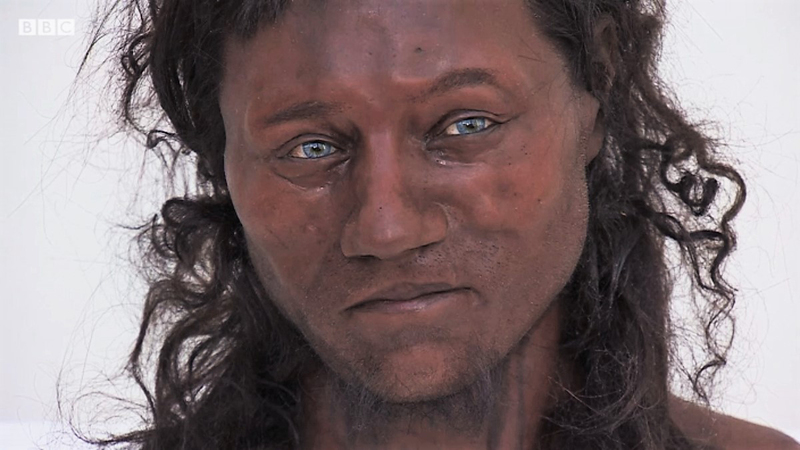 An article by Paul Rincon, Science editor on the BBC News website - Cheddar Man: DNA shows early Briton had dark skin - reports that the recent scientific analysis reveals that a Briton from 10,000 years ago had dark brown skin and blue eyes. Recent scientific analysis reveals that a Briton from 10,000 years ago had dark brown skin and blue eyes. Image: BBC. Researchers from London's Natural History Museum extracted DNA from Cheddar Man, Britain's oldest complete skeleton, which was discovered in 1903. University College London researchers then used the genome analysis for a facial reconstruction, now brought to life by the Kennis brothers. No prehistoric Briton of this age had previously had their genome analysed. The analysis provides new insights into the first people to resettle Britain after the last Ice Age, and underlining the fact that the lighter skin characteristic of modern Europeans is a relatively recent phenomenon. Cheddar Man's remains had been unearthed 115 years ago in Gough's Cave, located in Somerset's Cheddar Gorge. Examination has shown that the man was roughly 5ft 5in in height and probably died in his early 20s. A replica of Cheddar Man's skeleton now lies in Gough's Cave. Prof Chris Stringer with the Kennis brothers' reconstruction. Image: BBC. Professor Chris Stringer (above right), the museum's research leader in human origins, has been studying the skeleton of Cheddar Man for about 40 years. He states that coming face-to-face with what he would have looked like is indeed a surprise. The Natural History Museum researchers Prof Ian Barnes and Dr Selina Brace extracted the DNA from part of the skull. It yielded the highest coverage for a genome from this period of European prehistory, known as the Mesolithic, or Middle Stone Age. They teamed up with researchers at University College London to analyse the results, including gene variants associated with hair, eye and skin colour. The consensus was that the Stone Age Briton had dark hair, with a small probability that it was curlier than average, blue eyes and skin that was probably dark brown or black in tone. It was a common appearance in western Europe during this period. The analysis of Cheddar Man's genome will be published soon, and will also feature in the upcoming Channel 4 documentary The First Brit, Secrets Of The 10,000-year-old Man.